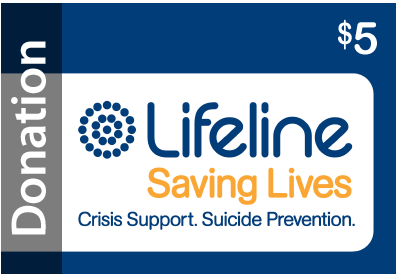 Lifeline is a national charity providing all Australians experiencing a personal crisis with access to 24 hour crisis support and suicide prevention services. Somewhere in Australia there is a new call to Lifeline every minute on our 13 11 14 crisis line. We now also deliver Online Crisis Support Chat – a private, one-on-one chat session available from 8pm - 4am (AEST), 7 days. We rely on the support of the community to sustain our services. Each dollar you give helps us save lives. Visit www.lifeline.org.au for more information. There are small transaction charges associated with processing charity gift cards. These are deducted and the balance is donated directly to the charity. Typically these charges are 5% or less.